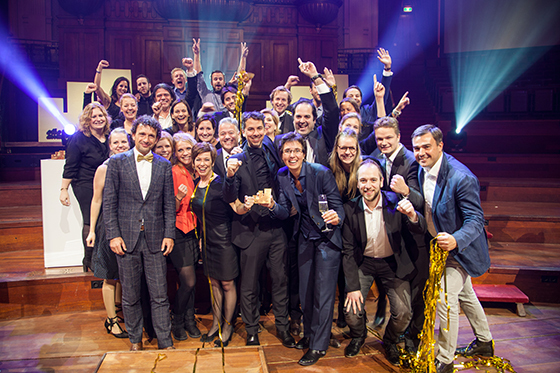 One Gold Effie, six Silver Effies, and five Bronze Effies were awarded at this year’s Effie Awards Netherlands Gala, presented by the Dutch Association of Communication Agencies (VEA). The most effective advertising campaigns were awarded at the Concertgebouw in Amsterdam during the sixth edition of 24Festival, formerly known as "The 24 hours of Advertising.” The Gold Effie Award was presented to Alfred International, UM, and Vijf890 for their campaign "How Jumbo surpassed the wildest expectations" for Jumbo Supermarkets. The Silver Effie Awards were presented to: Selmore Creative Agency, Mediacom, and SKODA for "The 14% exercise;" J. Walter Thompson Amsterdam, Mindshare, Social Embassy, and Unilever Benelux for "Andrélon - Get more out of your hair;" Alfred International, UM, Vijf890, RTL Netherlands and Jumbo Supermarkets for "The Jumbo supermarket gave very land on his thunder;" Roorda ExPRtease and the Ministry of Health, Welfare, and Sport for "NIX works;” Carat, Chunk and Dare Creattive, and Phillips for "Phillips Airfryer: The new frying;" and finally J. Walter Thompson Amsterdam, Social Embassy, Mindshare, and Unilever Netherlands for “Ruby with Zwitsal smell." The Bronze Effies went to Alfred International and Allsecur for “Allsecur honked sleeping car drivers awake;” Etcetera and HAK for "How HAK from the pot and came on the plate;" ATTENTION Social 1nFluencers, MEC Netherlands, and FrieslandCampina Riedel for "Taste DubbelFrisss Battle;" KOKORO Amsterdam and SImyo for “Simyo Friends Deal;" and finally Etcetera and Old Amsterdam for “Old Amsterdam cheese from dowdy to contemporary aged cheese with character." For more information on Effie Netherlands please visit their website http://www.effie.nl/.